We are bringing you some of the most fascinating collection that tells you all about Mount Kilimanjaro. Mount Kilimanjaro occurs in Africa. It has three volcanic cones known as Kibo, Mawenzi, and Shira. The Mount Kilimanjaro is the highest peak in Africa. Scientists have long been interested in studying Kilimanjaro precisely due to the fact that its glaciers and ice fields are rapidly disappearing. Let us study many more interesting Mount Kilimanjaro facts for kids. Where is Mount Kilimanjaro in Africa? The Mount Kilimanjaro occurs in Tanzania, Africa. In fact, it is the highest peak in Africa. Karl Klaus von der Decken and R. Thornton were probably the first persons who attempted to climb Kibo in August 1861. They couldn’t hike more than 8,200 feet. Charles New was the first European ever to get to the mountain—reaching the heights of 13,000 feet. In 1887, Hans Meyer attempted to climb but he got back since he didn’t have appropriate equipment to handle ice caps. Meyer was a German professor of geology. In 1888, Meyer made another unsuccessful attempt with Oscar Baumann but they were held hostage. In 1889, Meyer went on to climb Mt Kilimanjaro with Ludwig Purtscheller, an Austrian mountaineer. This time he made it rather successfully. Ludwig and Meyer established many campsites on their way up so that they may not face food shortage. Purtscheller and Meyer spent 16 days above 15,000 feet. Edward Oehler, a German climber was the first person to climb the summit of Mawenzi on July 29, 1912.
Who Made the Fastest Ascent? Karl Egloff, a Swiss-Ecuadorian guide, made the fastest ascent and descent. He did it in 2014. He climbed the Mt Kilimanjaro and got back in just 6 hours and 42 minutes. Kilian Jornet, a Spanish mountaineer, made the second fastest ascent. He ran to the top and back in 7 hours and 14 minutes. 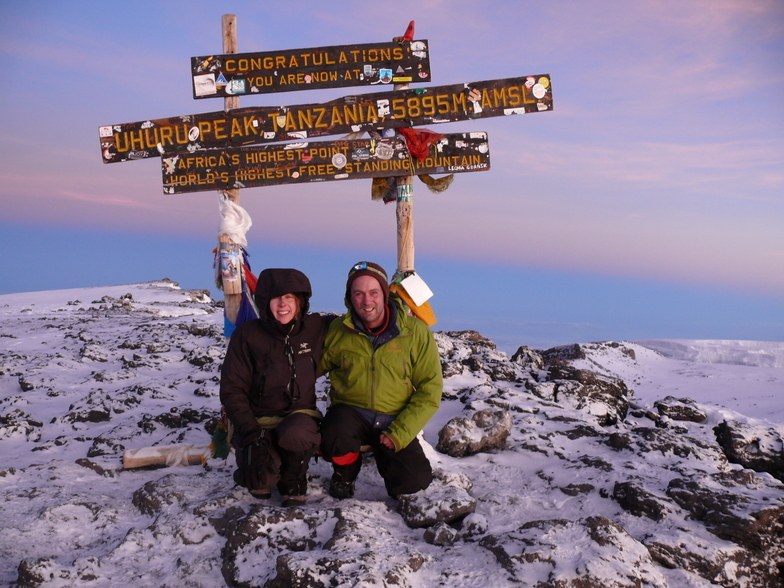 Kilian did it in 2010.
Who was the First Female to Climb Mt Kilimanjaro? Anne-Marie Flammersfeld is the first female to ascend the mountain. Marie ascent on July 27, 2015. Anne took 8 hours and 32 minutes to climb. Anne climbed via Umbwe Route that ran 19 miles long. The Mt Kilimanjaro consists of three different volcanic cones. Out of these three cones, the Kibo is the highest while Shira is the shortest cone. The Mawenzi measures around 16,893 feet in height and Shira is estimated at 13,140 feet. Kibo, Mawenzi (5,149 meters), Shira (4,005 meters). According to scientists, Shira and Mawenzi are extinct but Kibo can erupt anytime. The highest peak of Kibo’s crater is Uhuru Peak. 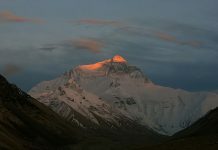 The peak estimated at 19,341 feet or 5,895 meters tall in 1952. However the current measurements show the height as 19,318 feet—a decrease of 23 feet over the past 60 years. Scientists haven’t been able to study the interior of the volcanic edifice. The first ever eruption at Shira center occurred as early as 2.5 million years ago. The last of the eruption took place about 1.9 million years ago. There is a broad plateau at the top of Shira measuring up to 12,500 feet (3,800 meters) in height. The height of Shira is estimated at 4,900 m (16,000 feet) to 5,200 m (17,000 feet). The youngest of the Mawenzi rocks are as old as 448,000 years old. Erosion has removed the eastern side of the mountain. The nickname of Mawenzi peak is Neumann Tower measuring up to 14,518 feet in height. The width of Kibo is about 15 miles (24 kilometers). The last of the activities took place from 150,000 to 200,000. Kibo has five main larva formations. How Did Kilimanjaro Get its Name? Johann Ludwig Krapf was the first person who used the name Kilimanjaro even though he didn’t attempt to prove this statement. Krapf stated that the word Kilimanjaro meant mountain of greatness. The mountain of caravans is another meaning of Kilimanjaro. How Did Mount Kilimanjaro Form? Mt Kilimanjaro was formed around 3 million years ago. It is not actually one mountain—it has three volcanoes that are set vertically one another. Mt Kilimanjaro was practically formed during the creation of Great Rift Valley. The first of the volcanic activities occurred on Mt Kilimanjaro were a million years ago. How Tall is Mount Kilimanjaro? The Mount Kilimanjaro is 16,100 feet from its base but it is 19,341 feet above the sea level. How Long to Climb Kilimanjaro? Depends entirely on the routes, but it mostly takes 6 to 7 days to climb Mt Kilimanjaro. Just to let you know that the mountain has seven different routes to climb. What Animals Live on Mount Kilimanjaro? Mt Kilimanjaro isn’t a suitable habitat for large animals to live on. Most animals are found at the low forests of Kilimanjaro. Climbers have frequently observed animals such as chameleons, warthogs, bushbucks, dik-diks, zebras, duikers, and hyenas. Prominent among animals are Kilimanjaro shrew and chameleon. Most climbers experience nausea and high altitude sickness during climbing. Mount Kilimanjaro facts for kids. Plants and vegetation covers as much as 250,000 acres of land on Kilimanjaro. The cultivated land consists of sunflowers, wheat, beans, and maize. Prominent among the Kilimanjaro plants are Acacia, Grewia, savanna vegetation, and Terminalia. Coffee is also grown between 3,300 feet and 5,900 feet. The southern side of the mountain contains montane forests including epiphytes and ferns. The height of the mountain is in itself shows pretty much the climate of Kilimanjaro. The mountain is not only at the highest altitude, it is also isolated from other mountains. Compared to the northern side, the rainfall appears to occur more at the southern side. Each year the rainfall occurs as much as 1,500 – 2,000 mm at a height of 4,900 feet. However, the lower side receives rainfall of up to 900 mm. The temperature at the summit is about −7 °C (19 °F). Nights are pretty cool at Mt Kilimanjaro with the temperature of −15 to −27 °C. Snowfall mostly occurs in November to December or March to May. The glaciers of the Mt Kilimanjaro have long been disappearing quite rapidly. The ice cap at Kibo is thought to split into two individual glaciers. The Kibo crater lies at the very center of the ice cap. During the Pleistocene epoch, the ice cap had covered 150 square miles. However due to the later dry conditions the ice fields at Kilimanjaro may have possibly become extinct 11,500 years ago. During the late 1880s, the Kibo summit was all covered with ice caps measuring up to 7.7 square miles. The glaciers began disappearing rapidly between 1912 and 1953 precisely because of the sudden shift in climate. According to conservationists, 85% of the Kilimanjaro ice covers disappeared between 1912 and 2011. The rate at which the ice disappeared each year between 1953 and 1989 is 1.4% while the rate between 1989 and 2007 increased up to 2.5%. Scientists estimate that the entire ice bodies are most likely to disappear by 2060. How Many People Died Climbing Mt Kilimanjaro? The Christian Medical Center Kilimanjaro suggests that Mount Kilimanjaro claimed as many as 25 lives ranging from 1996 to 2003. There were 17 females and 8 males. Most of climbers died of high altitude illness. The mortality rate at Mt Kilimanjaro is 13.6 per 100,000 climbers. How Is Mount Kilimanjaro Hard to Climb? According to studies, 60 – 70% of all climbers can successfully climb the mountain. About 77% of climbers had experienced mountain sickness. Most climbers likely experience diarrhea, loss of appetite, headache, vomiting, and nausea. There are very few permanent shelters on your route to Mt Kilimanjaro. The route via Arrow Glacier remained closed for many years because climbers fell from steep mountains and killed. However it was reopened in December 2007. Mt Kilimanjaro has 7 climbing routes from where climbers can ascend as well as descend the mountain. 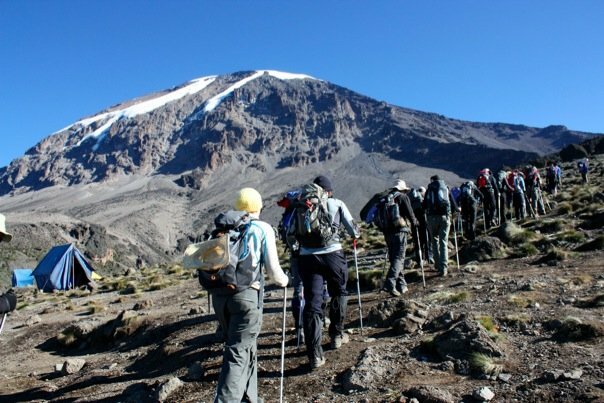 Seven Kilimanjaro routes are Marangu, Shira, Lemosho, Rongai, Umbwe, Machame, and Mweka. Machame is probably the most scenic of all routes. However, many climbers claim that the Norhtern Circuit routes and Lemosho are equally scenic. It will take 6 to 7 days to climb via Machame. If you prefer to climb via Lemosho the duration is about 6 to 8 days. The easiest of the routes is Rongai but it is less scenic. Kilimanjaro National Park generates one of the highest revenues of all Tanzanian parks. In 2013, it generated US $51 million. About 57,456 people visited the park out of which 16,425 visitors hiked the mountain. i) Who was the First Person to Reach the Top of Mount Kilimanjaro? Hans Meyer, a German professor and Ludwig Pursheller, an Austrian mountaineer were the first persons to reach the top of Mt Kilimanjaro. ii) How Many People Climb Kilimanjaro Each Year? Every year, 15,000 to 16,000 people attempt to climb Kilimanjaro. iii) Is Mount Kilimanjaro the Tallest Mountain in the World? No, Mt Kilimanjaro is not the tallest mountain in the world. It is the tallest mountain in Africa. iv) What is the Best Time to Hike Kilimanjaro? The best time to climb Kilimanjaro is probably January to March. It’s true that January is much colder than June or July but the ice slopes are quieter during these months. Thus, these are the preferred months. v) Does Mount Kilimanjaro have Snow? 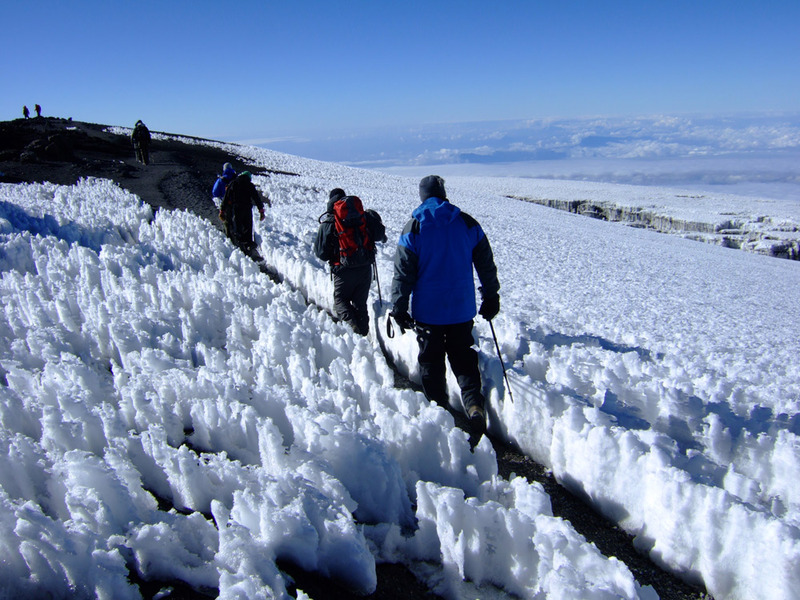 Yes, the Mt Kilimanjaro has thick snow and ice caps almost all year round. The highest peaks of the mountain consist of ice walls and massive glaciers. 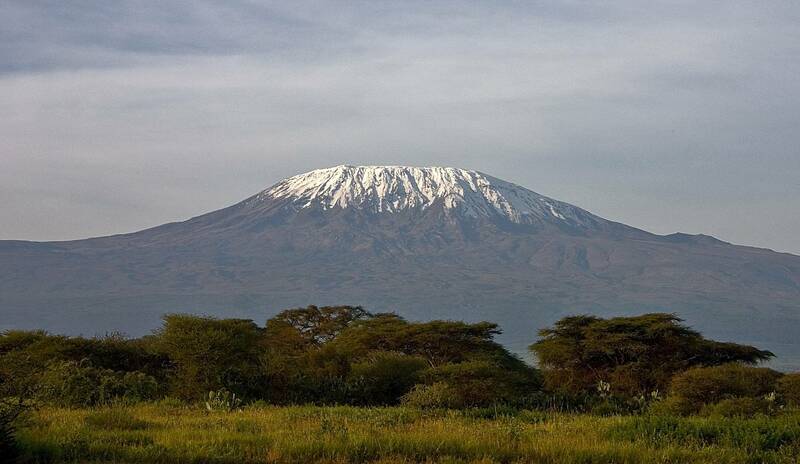 Lately however climate change has caused much of the ice caps on Kilimanjaro to disappear.